What is the Dupuytren Society doing? The International Dupuytren Society is a non-profit collaboration of patients and physicians to find a cure for this disease and to inform about therapy options. Material on this web site does not constitute medical advice. It is intended for informational purposes only. Please consult a physician for diagnosis and specific treatment recommendations! All you want to know about Dupuytren's contracture and Dupuytren'sdisease, including symptoms, treatment options, related diseases, research, and links to other resources. Dupuytren's disease (Dupuytren disease), also called Dupuytren's contracture or simply Dupuytrens, is a benign thickening of the palm's or finger's connective tissue. Dupuytren disease is the most crippling hand problem and affecting many people, especially when they get older. Dupuytren disease typically starts with a tiny nodule in the palm. Eventually cords develop and in progressed stages the affected fingers cannot be fully stretched anymore, thus resulting in what is called "Dupuytren's contracture". Note that below picture is showing a very progressed stage of Dupuytren's contracture. Most patients have much less severe symptoms of Dupuytren disease and many people with initial symptoms of Dupuytren's will never need any treatment at all. For those who need treatment, a variety of treatments is available, depending on the stage of disease and on the preference of the patients. All these treatments options of Dupuytren disease are explained on this website, including their potential side effects. the left ring finger cannot be stretched anymore. 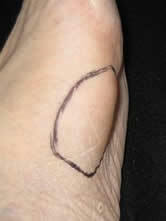 Large Ledderhose nodule in the arch of the foot. Ledderhose disease is similar to Dupuytren's contracture but with nodules developing in the arch of the foot. These nodules can become painful and can in severe cases grow to a size where they affect walking. As for Dupuytren disease, Ledderhose disease typically develops later in life. Patients suffering from Ledderhose disease often eventually also develop symptoms of Dupuytren disease and vice versa. Therapies for Ledderhose's disease are in part similar to those for Dupuytren's contracture but different in detail due to the different functions of hands and feet. Please note: a nodule in the hand or bent fingers can have completely other causes than Dupuytren's contracture: other_causes. As each cause requires a different therapy it is extremely important to have the disease properly diagnosed before starting any kind of therapy! The same applies to Ledderhose disease. In combination with Dupuytren or Ledderhose disease occasionally other, possibly related disease might appear, like knuckle pads (Garrod pads), Frozen shoulder or Peyronie disease. Potential co-morbidities like diabetes, epilepsy or vibration white finger are being researched; see related diseases. Our Web Site describes evidence based and established treatments, for example hand surgery, but also hew treatment options and results of recent research. Therefore our web site is constantly being updated. It might be worth visiting it frequently! Occasionally Dupuytren's contracture is also called - or occasionally misspelled - Dupuytrens contracture, Dupuytren's constricture, hand constricture, Dupuytren's contractor, dupitrons contracture, Dupeytron's, claw hand, old man's claw hand, crooked finger, lump in palm of hand, contracted finger or simply bent fingers. DUPC is an acronym for Dupuytren's contracture. In other languages: French: la Maladie de Dupuytren, Spanish: enfermeda de Dupuytren, Dutch: de ziekte van Dupuytren and contractuur van Dupuytren, Danish: Kuskefinger, Turkish: Dupuytren Kontraktürü. All cartoons of this page are by Tiki Küstenmacher, from the book "Mach was, Doc! ", Kösel-Verlag, Germany. The picture of a Dupuytren's contracture was provided by A. Meinel, Dupuytren-Ambulanz, Germany. Can these diseases be cured? Want to add another country organization?